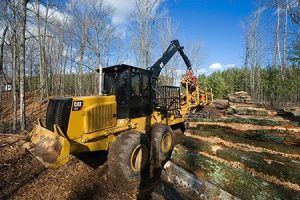 Caterpillar track and wheel skidders and forwarders remove logs from the forest. These machines deliver logs to processing areas, log landings and to the roadside as quickly and efficiently as possible. Skidders collect trees with winch lines and chokers or grab bunches of trees with grapples for transportation to the landing or processing area. Fowarders load processed logs from the ground to the bunk for transporting to the roadside. For log skidding applications, Cat builds a full line of both track and wheel skidders. Whether you’re working on steep terrain or in poor underfoot conditions, you’ll find a Cat skidder to match your needs. Forwarders feature high lifting capacity and travel speed to deliver logs to the landing area quickly and efficiently.